I am participated in Jon Acuff’s “Empty Shelf 2014”. Basically, you clear a shelf off one of your bookshelves and fill it with books you read in 2014. 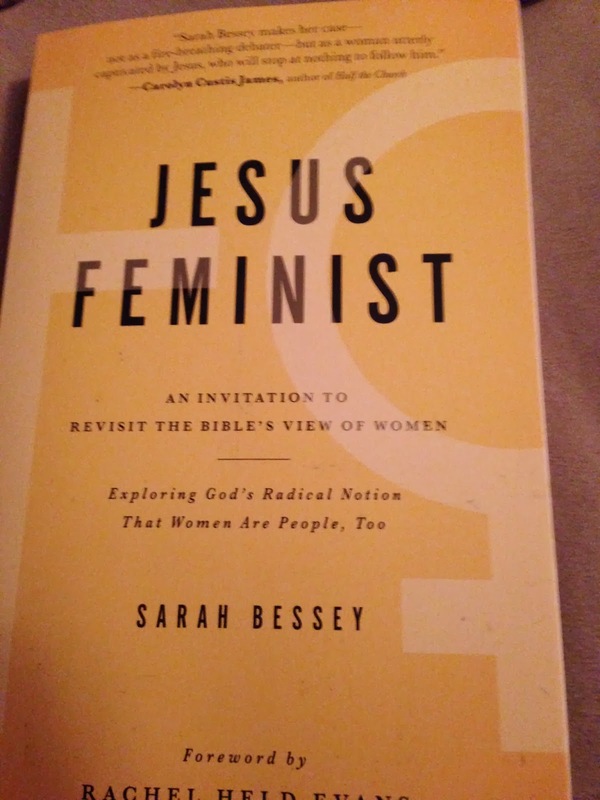 I finished my first book Tuesday night: Jesus Feminist, by Sarah Bessey. My thoughts and emotions were all over the place during this read. Part of the reason is that for most of the book, I wasn’t sure what the ultimate purpose of the book was and I couldn’t decide if I liked the author or if I agreed at all. First, here were my reservations before reading. 1) I wasn’t sure where she was going to go with the feminist thing. 2) I have some serious issues with the theology and practices of a few of the church leaders who endorsed this book. 1) The secondary heading after the title is “Exploring God’s Radical Notion that Women are People, Too” — I could tell she has a good sense of sarcasm and I wanted to hear her perspective. 2) I think there are many churches that overly limit the role of women and expect women to be flighty, stupid, and of little importance to the body of Christ. More writers should be calling attention to this injustice. For nearly all of the first chapter, I was right there with the author, saying “Amen” in my head. You see, you don’t have to look far in the Bible to know that God cares deeply about women. Eve was created, and he called her “good”. God met Hagar in the wilderness and gave her water and a promise — He saw her. Just read the gospel of Luke and you will see Jesus tenderly showing love and grace to women over and over. And you don’t have to look far to understand that God doesn’t have limits on what women are able to do. Deborah was judge over Israel – a woman leading a nation judicially, politically, militarily, spiritually…. Mary Magdalene was the first to testify of a resurrected Christ at a time when a woman’s testimony could not be admitted in court. Yes, clearly God does think that women are people, too. Ummmm, excuse me, but what the what??? I’m not even going to get into the argument of whether or not women should be pastors and the head of local churches, because, honestly, though Bessey often hints that this is what she believes, she never lays out an argument for this and, by the time I got to the end of the book, I realized the issue of women pastors is not really what the book is about. However, I found the above statement so contrary to what I believe to be accurate (and absurd, quite frankly) that I got a little angry and put the book down for a week. That could not possibly be what happened. Jesus chose the twelve intentionally, and if I believe that, I must believe the reverse — he did not choose others equally intentionally. It was not an oversight. That’s all I’m saying about that. The rest of the book goes on to talk about Bessey’s own experiences in the church, both positive and negative. I got the sense, after a while, that she has been deeply hurt by the church and writes as one wounded, but longing for it all to be redeemed. Reading some of the stories in the book made me want that, too. At times, the tone of her plea sounded a whole lot like, “We just want our place at the table,” which drives me crazy, but I think part of that is her extremely sentimental and poetic writing style. For example, there is one whole chapter that talks about her labor and delivery experiences and how they were so beautiful and ugly and painful and joyous that the were defining moments in her relationship with God. Then, she states that there should be more sermons about childbirth and motherhood…..this isn’t theology, more just a personal preference, but I do not want it at all, especially if they are as graphic as her story. Amen. Call me one, too.